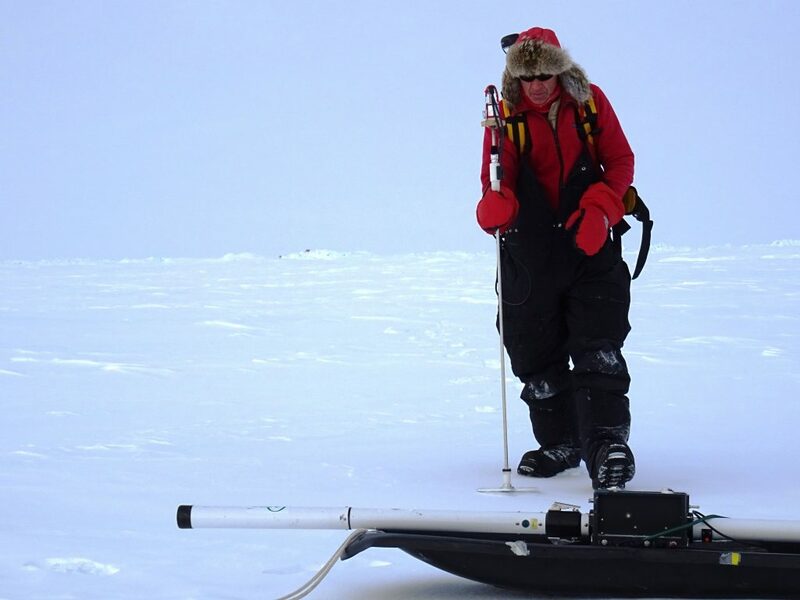 The first results from measurements taken on the ice during the CryoVEx campaign show that the sea ice between Canada and the North Pole continues to get thinner. One of the objectives of the CryoVEx campaign was to observe how snow and sea-ice thickness varies along a CryoSat track from the coast of Canada across the multiyear ice zone into the first-year ice further north. A week after this part of the CryoVEx campaign was completed, data processing has progressed and we can present some first results. These will be invaluable for CryoSat and IceBridge data processing by the various data product groups, for assessment of the state of Arctic sea ice after an exceptionally warm winter, and for initialising predictions of summer ice conditions. The figure below shows that mean ice thicknesses ranged between 2 and 3.4 m. The thickest ice was found in the vicinity of a prominent shear zone between an ice bridge in the Lincoln Sea (between Ellesmere Island and Greenland) and mobile pack ice to the north. The thinnest ice was found furthest to the north, representing second- and old first-year ice. The results show that the objective of fully crossing the multiyear ice zone was successfully met. Modal thickness is the most frequently occurring thickness representative of thermodynamically grown level ice. It ranged between 1.8 and 2.9 m, including 0.25 to 0.4 m of snow (see below). The multiyear ice thickness was little different from measurements at the same latitude during previous CryoVEx campaigns in 2011 and 2014. It was 0.2 m thinner than in 2014, but of the same thickness as in 2011. 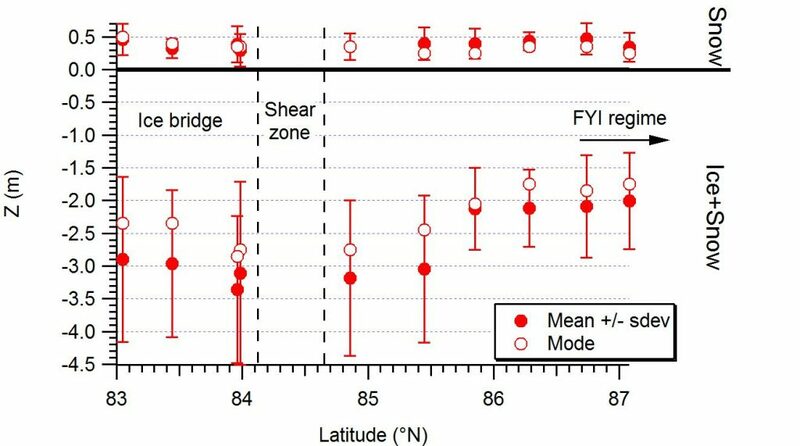 Second- and first-year modal ice thicknesses ranged between 1.8 and 1.9 m. This is thinner by 0.2 m or so than may be expected from previous airborne measurements, which indicated second- and first-year ice thicknesses of around 2.0 m in the same region. There are no representative in situ measurements to compare with. The observed thinning is less dramatic than may have been expected from the observed, widespread higher air temperatures in the 2016/17 winter. It is possible that the relatively thin snow cover at the northernmost station (mean (modal) snow thickness 0.34 m (0.25 m)) has compensated for the effect of warmer air temperature by allowing more ice to grow despite warmer air temperatures. The top portion of the figure shows that in contrast to the ice, snow thickness varied strongly and no spatial trends were observed. Mean and modal snow thicknesses ranged between 0.3 to 0.47 m, and 0.1 to 0.5 m, respectively. On average, the snow thickness standard deviation at each site was approximately 50% of the mean thickness. Even with thick snow conditions, bare shallow hummocks without significant snow cover did frequently occur. Average snow thickness was within ±0.05 m of the Warren snow climatology, but with strong site to site and local variability. 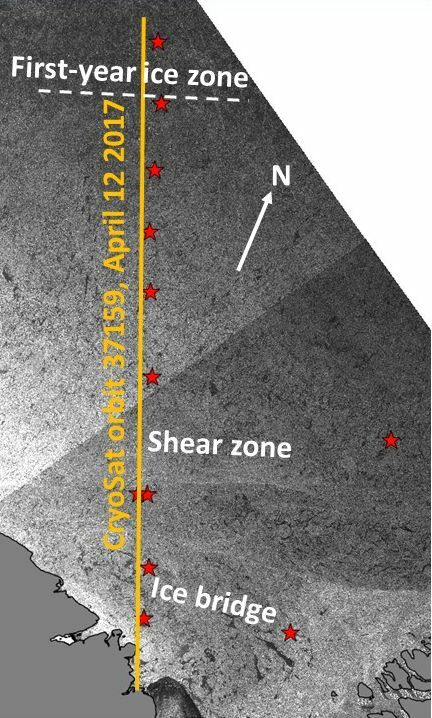 — We know that the ice above the shear zone did not form there but instead along various trajectories taken over during the fall and winter. Are not the applicable temperatures those along the 1000’s of km trajectories, not the winter temperatures along the fixed transect, possibly invalidating your conclusion of ‘more ice’ than expected? — Is the ice consistently thinner than those calculated by Piomas and how does this affect whole ocean volume? 1. Yes it is correct that the ice moves a lot which complicates interpretation of thickness changes, in particular of multiyear ice which has drifted the furthest and has undergone several growth and melt seasons. It is easier for first-year ice. However, our general statement about warmer Arctic air temperatures concerned the whole Arctic, and therefore ice growth in the central Arctic Ocean will have been a little less then usual everywhere. 2. Our data cannot easily be compared with Arctic-wide estimates of thickness or volume. I am not sure what PIOMAS shows in our study region. However, PIOMAS is only a model. Hopefully it can be validated with our data. Due to the limited regional coverage of our study we cannot state Arctic-wide ice volume change. However, very likely, with thinner ice, overall volume will be less too.